A major contributor to growth of the ophthalmology surgical devices market is rising burden of eye disorders across the world. Globally, disorders such as cataract, glaucoma, and age-related macular degeneration (AMD) are the leading causes of blindness and visual impairment. According to a report published by the World Health Organization (WHO) in 2010, cataract was responsible for causing blindness in 20 million people across the globe, which represented around 51% of the world blindness. Glaucoma was estimated to cause blindness in 4.5 million people, which accounted for around 12% of the global blindness. In addition, AMD was the third leading cause of blindness with worldwide prevalence rate of 8.7%. The growing burden of these eye conditions coupled with rising elderly population is expected to increase the need for corrective surgeries in the near future, subsequently stimulating the need for devices and systems used in these surgeries. Another key factor driving the market is several initiatives launched by countries as well as multilateral organizations for eradicating blindness. The Action Plan for Global Eye Health 2014–2019 proposes to decrease avoidable visual impairment considering it as a public health issue and to provide the visually impaired with access to rehabilitation services. As per the action plan, multilateral organizations along with their member states have set a target of reducing the number of patients with avoidable visual impairment by 25% by 2019, from the baseline established by the WHO in 2010. Additionally, high unmet needs for refractive surgeries led by the large number of patients with myopia or short-sightedness are also expected to fuel the market during the forecast period. As per a report published in the ‘Ophthalmology’ journal, around 30% of the global population is myopic or short-sighted currently and it is projected to increase to 50% of the global population (around 5 billion) by 2050. On the flip side, high costs (particularly of ophthalmic laser treatments) and high risks associated with ophthalmic surgery are projected to hamper the market during the forecast period. Technological advancements in surgeries such as cataract and glaucoma have led to increased safety and efficacy of these surgeries. This has helped improve patients’ acceptance of these treatment options. Also, launch of new ophthalmology surgical devices by major manufacturers is projected to create new growth avenues for the market in the next few years. 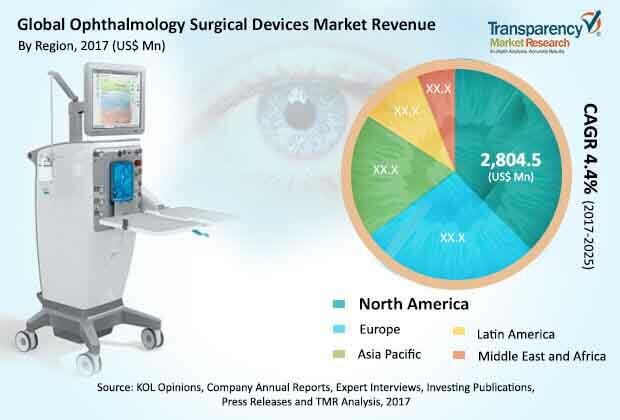 Geographically, North America held a major share of the global ophthalmology surgical devices market, in terms of revenue, in 2016. The trend is projected to continue from 2017 to 2025, primarily due to large pool of patients with eye disorders and the larger number of patients undergoing eye surgeries in North America than other regions. Additionally, the government support in the form of additional funding for research & development of ophthalmology surgical devices is anticipated to help the region retain its dominance throughout the forecast period. The Asia Pacific market is expected to register a significant growth rate during the forecast period, due to increased participation by local governments in the region in improving health care infrastructure and risen initiatives in the region for eradicating factors causing avoidable blindness. Major players operating in the global ophthalmology surgical devices market are Alcon, Bausch & Lomb, Carl Zeiss Meditec AG, Glaukos Corporation, HOYA Corporation, IRIDEX Corporation, Johnson & Johnson Vision Care, Inc., Lumenis Ltd., Inc., NIDEK CO., LTD., and STAAR Surgical Company. Manufacturers of ophthalmology surgical devices can focus on strategic collaboration agreements. This would help them penetrate largely untapped markets in developing countries that have large patient population with eye disorders but less access to proper treatment options. Developing innovative technologies that help in reducing the cost of treatment incurred for eye surgeries, which is a high barrier for patients in developing countries, can help in addressing high unmet needs in these countries and also, in reducing the socio-economic burden associated with blindness. Ophthalmology surgical devices are products used during ophthalmic surgeries for treating eye conditions such as glaucoma, cataract, diabetic retinopathy, age-related macular degeneration (AMD), and refractive errors such as myopia, presbyopia, astigmatism, and hyperopia. This report analyzes the current and future prospects of the ophthalmology surgical devices market based on product, end-user, and geography. The research is a combination of primary and secondary research conducted for understanding and arriving at trends and used to forecast the revenue expected to be generated in the ophthalmology surgical devices market in the near future. Primary research forms a bulk of research efforts with information collected from in-depth interviews and discussions with a number of key market experts and opinion leaders. Secondary research involves the study of company websites, annual reports, press releases, investor presentations, analyst presentations, and various international and national databases. The report provides estimated market size in terms of US$ Mn by product, end-user, and regional segments for the period from 2016 to 2025. The report comprises an elaborate executive summary, which includes a market snapshot that provides information about various segments of the market. It also provides information and data analysis of the market with respect to segments based on product, end-user, and geography. The market overview section of the report analyzes market dynamics such as drivers, restraints, and opportunities that influence the global ophthalmology surgical devices market in the current and future scenario. The report also provides Porter’s five forces analysis that studies five factors and their impact on the market. Market share held by key market players has been analyzed in order to signify the contribution of these players in the market in terms of percentage share. All these factors would help market players to decide business strategies and plans to strengthen their position in the global market. Based on geography, the global ophthalmology surgical devices market has been categorized into five major regions: North America, Europe, Latin America, Asia Pacific, and Middle East & Africa. The study also covers detailed analysis of the ophthalmology surgical devices market in countries in the respective region. The report also profiles major players operating in the market, offering their various attributes such as company overview, financial overview, product portfolio, business strategies, and recent developments. Major companies profiled in this report on the global ophthalmology surgical devices market are Alcon, Bausch & Lomb, Carl Zeiss Meditec AG, Glaukos Corporation, HOYA Corporation, IRIDEX Corporation, Johnson & Johnson Vision Care, Inc., Lumenis Ltd., Inc., NIDEK CO., LTD., and STAAR Surgical Company. Development of new products and strategic collaboration agreements was primary strategies adopted by major market players to strengthen their position in the ophthalmology surgical devices market.